I’ve been holding off on posting this for a couple of days, it is significantly more wordy than my usual posts. So, if you just want to get to the recipe, scroll on down, I won’t be offended at all I promise. If you are interested in my ramblings while forced to sit at home waiting for the UPS guy, enjoy. At 4:30 last friday night I was fighting tears as I stared blankly at my computer screen; after 5+ hours of working on my database management class assignment, I was cross-eyed and more frustrated then I’d been since high school algebra. My almost-wife, Alaina, whose birthday we were going to be celebrating that night, called. I burst into tears, sobbing about the stupid classwork, how the house wasn’t clean, dinner wasn’t started, her present wasn’t finished, and I hadn’t even showered yet. She was more than a little surprised since I am usually very put together and on top of things, but here I was in the middle of my last quarter of graduate school and I was losing it. She was wonderful and stepped right in to comfort and support. She even called our friends who were on their way over for dinner to ask them to stop at the store and the bakery to pick up the things I didn’t have time to get. It was her birthday and she came home and cleaned the house while I sobbed my way through the rest of my assignment. For the past almost three years this has been the way of our life, some couples live paycheck to paycheck, we live assignment to assignment until Christmas break, or Spring break when we finally emerge triumphant over another quarter of graduate school with one more class under our educated belts. There have been more than a few tears over the years as the assignments and overwhelming expectations got the better of us. Last spring Alaina graduated with her masters in teaching degree and hopes of a full-time teaching job, which was met when she started teaching middle school algebra in September. I slogged through three more quarters of classes, including one quarter over the summer. I’m three weeks and three assignments away from being done with my masters in library and information science degree. These last few weeks have been the hardest of the whole program, perhaps it is the “senioritis” setting in or maybe the academic bar really has been raised this quarter as I push myself to achieve the quality of work I know I am capable of. More than any other quarter so far, I find myself feeling guilty for not doing more: more for our friends, more for my partner, more for my family, more at work, more for the blog/s, more for myself. I feel like until this quarter I’ve been able to stay just ahead of the curve and at least feign composure. These past few weeks, I’ve been a M.E.S.S. and a guilty mess at that. After that remarkably stressful afternoon and a few glasses of wine over dinner I realized that reason I feel like I’m not able to do enough, is that I’m doing a lot. While this might not seem like a very astounding revelation, I think for many of us we do what is in front of us without adding it up to see what we are really asking of ourselves. Sure, finishing graduate school is a big feat in and of its self, but add to that a part-time job that requires a full-time brain commitment, planning an August wedding, caring for and keeping two blogs, applying for jobs and preparing myself to be a professional in my chosen field, and basic household necessities of doing dishes, and cleaning showers. When I put it all together it seems like more than a few full-time jobs! No wonder I’m cross-eyed and sobbing. So, here is perhaps the biggest and hardest lesson that I am learning this quarter: take ownership in all that you do. Not in an accountability sort of way, because I’m pretty sure we all hold ourselves to way higher standards than anybody else, but in a way that forces us to realize all that we do and all that we are accomplishing. Once you’ve done that, give yourself a pat on the back and maybe a glass of wine because you totally deserve it. I first made this ravioli dish during our January Vegetarian challenge, Alaina loved it so much she requested if for her birthday dinner. Luckily for me is really quite easy and very quick. 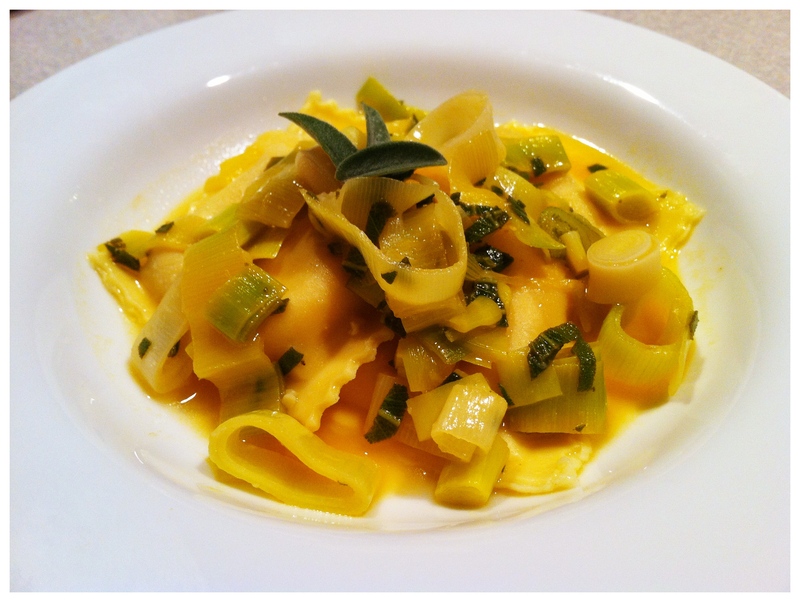 I used Rising Moon’s Vegan Organic Butternut Squash Ravioli purchased from the freezer section of my local co-op. I have plans to make my own ravioli very soon, but when you are short on time Rising Moon’s ravioli are all very good. Bring a large pot of water and a pinch of salt to boil. When it is boiling, reduce to medium and add ravioli, cook according to package. While the ravioli cooks, heat butter and olive oil in a large skillet over medium-high heat. Once it’s hot, add the leeks and saute until they begin to soften. Add wine to leeks and allow to evaporate slightly. Add the broth and allow to cook down until leeks are soft and tender. Add sage and season with salt and pepper. If you are not making it vegan you can stir in some parmesan cheese or a splash of cream. Add ravioli to a plate and top with leek sauce, garnish with additional sage and parmesan if desired. This entry was posted in Pasta, Quick dinner, Recipe, Vegetarian/Vegan and tagged Leeks, pasta, Ravioli, Recipe, Vegetarian/Vegan. Bookmark the permalink.